A remarkable line-up of music heavyweights that includes Sir Tom Jones, Mariah Carey and Enrique Iglesias celebrate the 15th Anniversary of Emirates Airline Dubai Jazz Festival. Support Acts include The Rad Trads, Raul Midón and Nathan Sykes are all set to perform alongside this year’s headline acts. 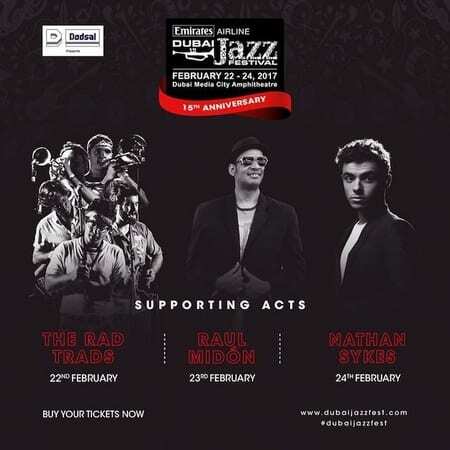 Dubai, UAE – 18 February 2017: This year the Emirates Airline Dubai Jazz Festival celebrate their 15th Year Anniversary by announcing the festival’s largest and remarkable lineup with Sir Tom Jones opening on 22nd February, Mariah Carey on the 23rd February and Enrique Iglesias on the closing night, 24th February. In addition to the headline artists, guests will be treated to performances from a number of supporting acts which include The Rad Trads, Raul Midón and Nathan Sykes who have all proved their musical merit. Undeniably the biggest Latin recording artist in music history, Enrique Iglesias has sold more than 130 million albums worldwide, released ten studio albums plus two greatest hits compilations, and is a multiplatinum artist in almost every country around the world. Enrique’s illustrious career has earned him 27 #1 singles on the Billboard Latin Songs Chart as well as having multiple #1’s across the Billboard charts with a combined total of 105 #1 charted positions. He holds the record for most weeks at #1 on Billboard’s Hot Latin Songs chart with his hit “Bailando” at 42 weeks, and the music video has gained over one billion views on YouTube. Enrique’s 14th #1 Dance Club Song, “Tonight (I’m Loving You),” made him the king of the chart beating out Michael Jackson for the most #1’s in Billboard history. The best-selling female artist of all time, with more than 220 million records sold and eighteen #1 singles – the most for any solo artist in history – Mariah Carey is a luminous and enduring talent who has enthralled audiences for a quarter-century. Known for her distinct five-octave vocal range, she is equally distinguished as a songwriter, penning all but one of her #1 singles, including “Fantasy,” “Always Be My Baby,” “Hero,” “Touch My Body,” “One Sweet Day” and “We Belong Together,” more than any other solo artist. New York City-based blues musicians, The Rad Trads have rapidly gained a reputation as one of the city’s most charismatic live acts and will be gracing the stage on Wednesday 22nd of February and supporting headline act Sir Tom Jones. Featuring four captivating lead musicians – Alden Harris-McCoy (vocals and guitar), Johnny Fatum (vocals and percussion), Michael Fatum (trumpet), Michael “Big Red” Harlen (vocals and bass), Patrick Sargent (vocals and saxophone) and “Tall” Sam Crittenden (trombone) – The Rad Trads’ success story is an interesting one of four close friends who studied at NYU and began playing for drinks at their favourite Brooklyn bars. Their music also features powerful horns and a driving rhythm section. They cite influences ranging from The E Street band and Mad Dogs and Englishmen to the Beatles and Taj Mahal as having shaped their music. Having been dubbed “a one-man band who turns a guitar into an orchestra and his voice into a chorus,” by The New York Times, Raul Midón is no stranger to fame. The singer-songwriter and guitarist who has earned acclaim as one of music’s most distinctive voices, is set to charm audiences by lending his musical chops and being the supporting act to Mariah Carey who will be performing on Thursday 23rd of February. Raul Midón has collaborated with heroes such as Herbie Hancock and Stevie Wonder, and has also contributed to recordings by Jason Mraz, Queen Latifah and Snoop Dogg. Blind from birth, the New Mexico native has released seven albums since 1999 including the hit studio productions, State of Mind, A World Within a World and Synthesis. His most recent release is the captivating CD/DVD Invisible Chains – Live from NYC. Seasoned listeners will be able to pick out the influences of Donny Hathaway and Richie Havens as well as Sting and Paul Simon. With previous artists including the likes of Santana, Sting, John Legend, The Script, Deep Purple, Jason Mraz, Jamie Cullum, James Morrison, James Blunt, Christina Perri and more, The Emirates Airline Dubai Jazz Festival has been one of Dubai’s staples for outstanding performances. It is also the most recognised music event in the UAE and the region receiving more than 20 awards and nominations since its launch in 2003. The annual musical extravaganza continues to be one of the most anticipated events in Dubai’s calendar and promises to elevate audience experiences on its 2017 edition with an exciting line-up of entertainment and offerings. To stay updated, visit www.dubaijazzfest.com or join the ongoing social media conversation via Facebook, Twitter and Instagram@DubaiJazzFest.